I just finished this second book in the Harry Potter series for my third time. The funny thing about these books, however, is that I can’t ever seem to remember them well. Because each of the seven takes place at the same location with the same characters, I get the plots all confused. There isn’t a whole lot to differentiate one from the other except the actual events of the adventure. Ah, well. That just means each time I read them, I enjoy them as much as the first time. In The Chamber of Secrets, Harry finds a diary that contains the magical memory of Tom M. Riddle, a boy who attended Hogwarts fifty years before. A memory that can interact with living students. Yet many other things come to light that also happened fifty years ago–the chamber of secrets first opened, a student died, Hagrid got expelled. In the meantime, SOMETHING is haunting Hogwarts, attacking students and speaking threats inside Harry’s head. Harry and his friends are determined to get to the bottom of it, but they don’t understand that Tom-the-memory wants Harry dead, and he has all the weapons and cunning he needs to see it happen. I was struck again by Rowling’s names and characters. She’s often uses alliteration, the repetition of sound, to good effect. Check out these names of wizards for which each house of Hogwarts is named: Godrick Gryffendor, Helga Hufflepuff, Rowena Ravenclaw and Salazar Slytherin. Even when sounds don’t repeat, they’re just fun names, like Albus Dumbledore, Gilderoy Lockhart, Mundungus Fletcher and Nearly Headless Nick. And she gives each a distinctive personality. And here are some more examples of a wild imagination that makes reading her books so much fun: A “howler” is a letter that explodes in a burst of magnified yelling as soon it’s opened. The subjects of wizard pictures can move, speak, or leave the frame altogether. Floo powder enables the user to magically travel anywhere, via a network of interconnecting fireplaces. Moaning Myrtle haunts a toilet in the girls’ bathroom. And at one point, Ron Weasley’s broken wand backfires and he belches slugs for the next several pages. Kid-pleasing stuff. Fun stuff. FUN is exactly why I read them over and why I so highly recommend them. Not the highest literary quality out there, but very, very fun to read. Once again, however, let me utter a word of caution. The series contains some dicey occultic elements that parents must consider for age appropriateness. In this book, Voldemort possesses a ten-year-old girl, and Harry has to battle not just one, but two satanic figures. Also, Harry and his friends very irresponsibly keep crucial information from Dumbledore and intentionally take dangerous matters into their own hands without the knowledge or permission of authorities. And finally, of lesser consequence but still worth mentioning, the Mandrakes that the students grow to dice up and brew into a needed potion act very much like humans in their behavior and growth. Yet in all this, Harry remains GOOD, and brave and compassionate, even to the point of being willing to sacrifice his own life for another. 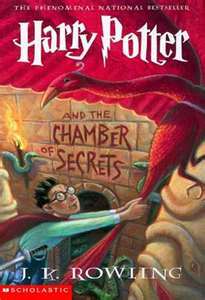 In my personal opinion, Chamber of Secrets is well worth a read. Previous What’s your favorite book turned movie? Erik, these books are a lot of fun, and you’re right to anticipate them so highly. But they also have some VERY dark, evil moments. In this one, Voldemort possesses a ten-year-old girl, which I see I forgot to mention in this not-so-balanced review I just wrote. Your mom is wise to give you a couple more years before you have to sort through such controversial spiritual elements. Be patient. You’ll get there… In the meantime, I think I have to add a paragraph to my review! Michelle, you are a voice of reason in the world of “Jersey Shore” 😉 Sticking to my decision – he’s too young yet! However going to go out over the weekend to buy a TV to be alble to watch the Chronicles of Narnia – I think it’s a good trade off! That is a great trade-off. I admire you for sticking to your guns. I haven’t regretted making my daughter wait. I’m much more comfortable with her dealing with this content in middle school. Sorry I’ve got this ongoing series about Harry in the works that will probably make Erik anticipate them even more, but if you haven’t read all of them, at least you’ll get the play by play.